Every day, we perform a large number of habitual actions without ever stopping to think that there might be unexpected paths available to make our routine less arduous. We just love making things easier and suggest you take a look at the following 17 tricks that you’ll want to try out straightaway. 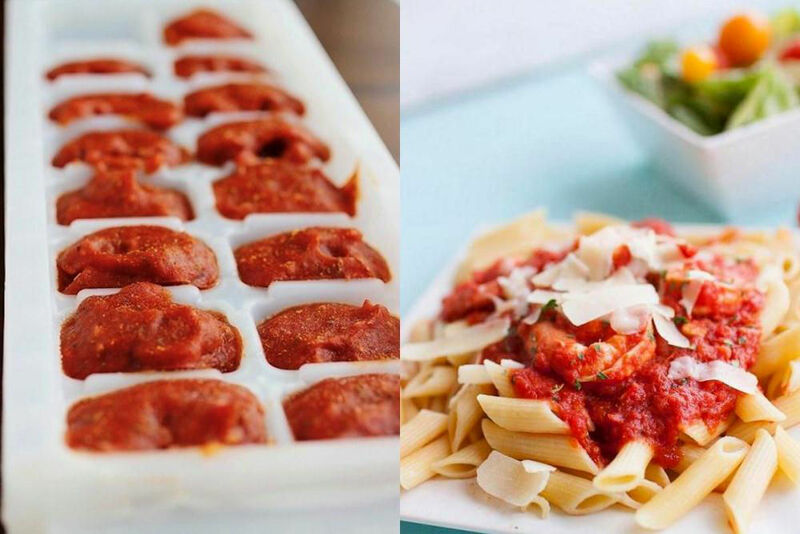 Leftover sauce can be frozen in an ice cube tray and put to good use when you don’t have time to make a proper meal. Just reheat it along with some macaroni and cheese, and it’s ready in an instant. This is one of those tricks that will make you want to kick yourself for not having thought of it yourself. It really is obvious: to cut very thin slices of cheese, just use an ordinary potato peeler. If you haven’t got a juice squeezer to hand and need to squeeze the juice from a lemon just using your hands, heat the lemon up in the microwave first and the task will be much easier. The 57 marks the sweet spot to help you get the sauce out. To get the best result, you should turn your ketchup bottle at an angle and hit exactly on the point of the 57 to get maximum stream. Broken glass can be a real headache. Luckily, there’s a trick you can use to simplify the process of cleaning it up: all you need is a slice of bread. 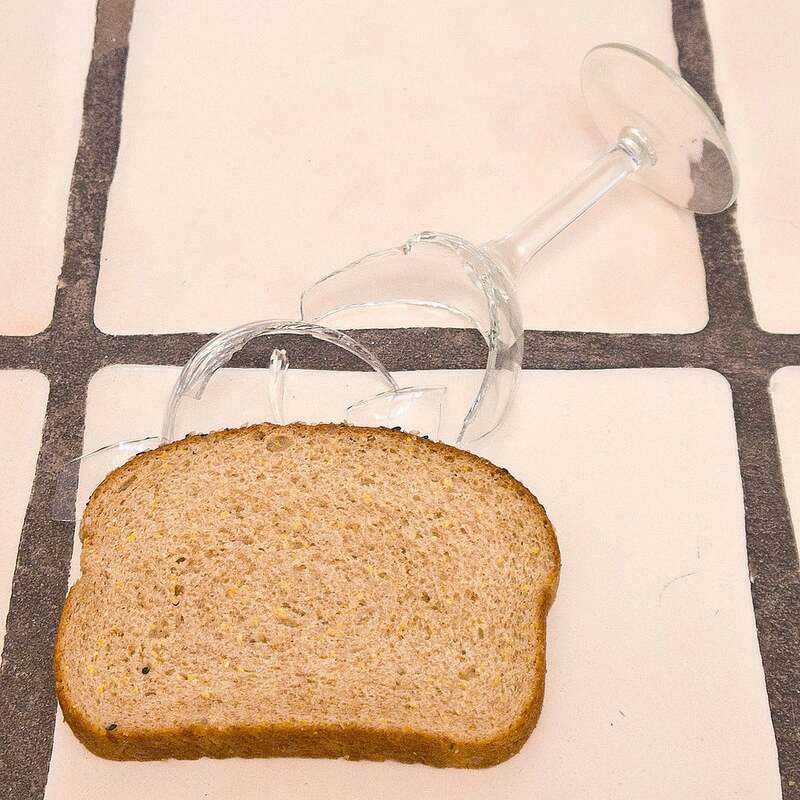 Thanks to its texture, bread can sweep up even the tiniest pieces of glass that we don’t see. 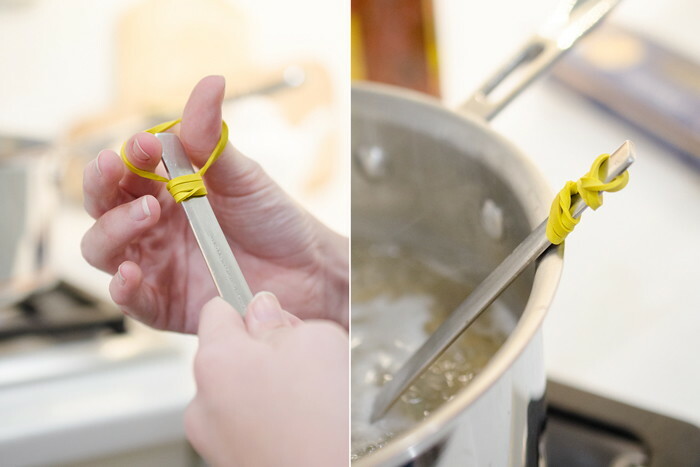 To make sure your spoon doesn’t fall right into your cooking pot, simply wrap an elastic band around the end of it. Simply stand the cob upright in a Bundt pan, and slice off the grains of corn with a sharp knife. In the end you’ll have all the corn in a bowl and no mess anywhere. 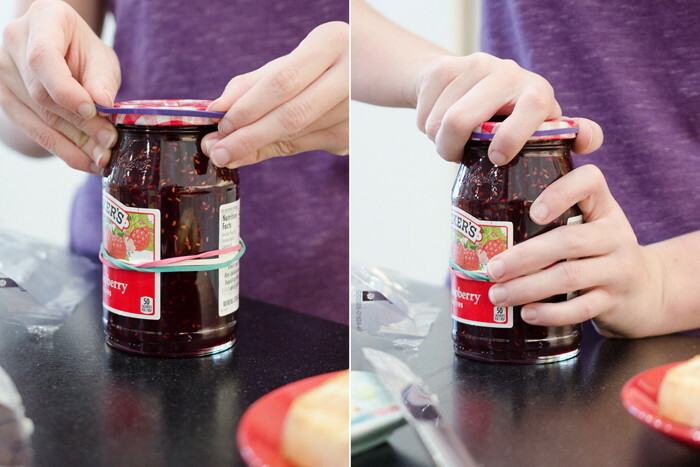 Pretty much everyone’s tried at one time to unscrew a tight jar lid using a towel. But if this age-old trick doesn’t work, we’ve got an alternative: try using an ordinary rubber band like in the photograph shown here. The result may surprise you. 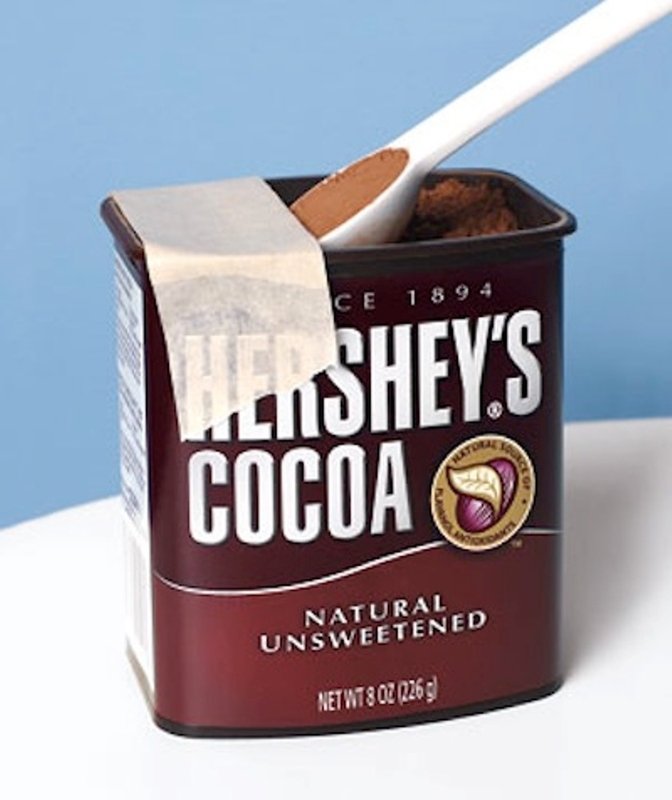 To get a precise measurement of a product, use a piece of masking tape stuck to the top of the container. simply place a wet paper towel underneath it. This one is ingenious. 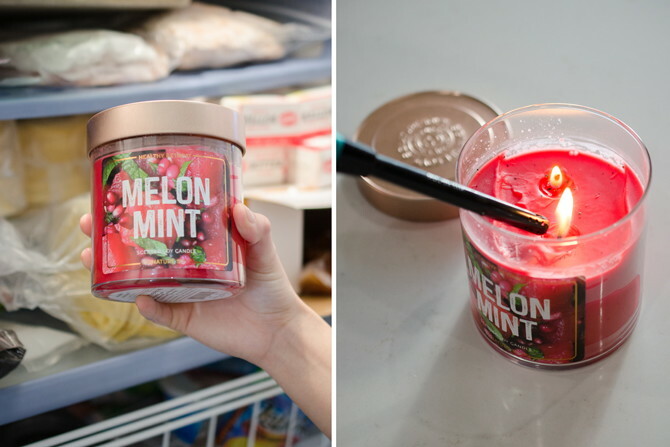 Simply place your wax candle in the freezer for a full day before lighting it. The candle will burn more slowly — and last twice as long. It sounds strange, but it really works. When you haven’t got any long safety matches to hand, a piece of raw spaghetti will do the trick. It can light at least two candles! Everybody knows that plastic garbage bags split with irritating regularity. But there’s actually a simple solution to this: attach the bag to the sides of the bin using clothing hooks. It’s not always easy to find the right-sized brush for cleaning out a bottle, but there is a trickthat can help: sprinkle some pieces of crushed eggshell into the bottle, put on the cap, and give it a good shake. The eggshell will help clean all the dirt from the inner walls of the bottle, and then all you need to do is rinse it out. 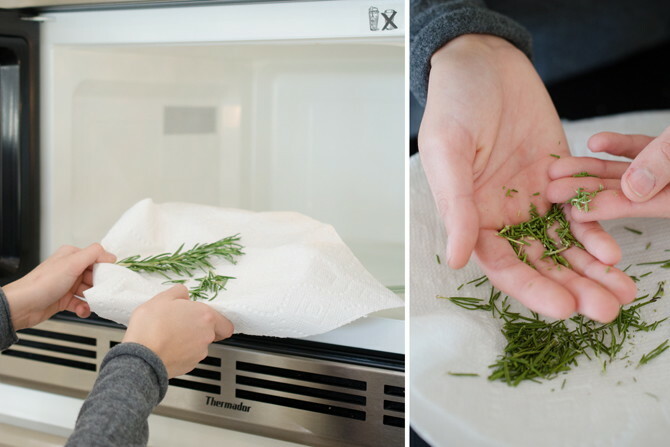 When you’re left with only a small amount of fresh herbs after cooking, don’t throw them away. Simply dry them out by placing them in the microwave for a minute, and then you can save them until next time. A quick and simple way to decorate cupcakes is to use powdered sugar sprinkled through a piece of lace. Shattered the back glass of your iPhone? You could buy a new one — or you could get a little more creative: draw all over the back of the phone with a colored highlighter, then rub the excess ink off with a paper towel so that it only stays in the cracks. Cover it with a piece of packing tape or a coat of clear nail polish, and you are the owner of a reborn, cooler phone.